The second biggest employer of people needing housing assistance? Public schools. Tammy Larkin has lived in subsidized housing her whole life. Most of the time, she's had low-wage jobs: cashiering at Best Buy and Academy Sports, working in the Post Office, serving as a security guard, serving as a daycare attendant and home health aide. In 2013, she took a job in a Houston school cafeteria, increasing her earnings to $11.40 an hour, but still not making enough to afford housing on her own. Larkin qualifies for a $200 housing voucher on a $900-a-month apartment for her and her two teenage sons. She'd just as soon not. "I don't want to be on it, because I want to be able to do it myself, really," Larkin, 52, said of the subsidy. "But when you have no choice, you have no choice." Larkin is among millions of working Americans who can't afford housing, health care or food without public assistance. But in Larkin's case, the employer paying wages low enough to qualify her for government subsidies isn't some low-margin retailer or restaurant — it's the government itself. In Houston, the Houston Independent School District was the second biggest employer of public housing residents and voucher recipients in 2016. While the numbers are relatively low - 261 of the renters in subsidized housing worked for the schools, and 310 for Walmart — they nonetheless show that the low wages that might reduce prices or trim government budgets have other costs that are not immediately seen. That's true across the economy: The safety net primarily serves those who have jobs. In Texas, according to a study by the University of California, working families receive 67 percent of the benefits the federal government distributes - an unusually high average. On housing specifically, 77 percent of non-elderly, non-disabled people receiving federal rental assistance are working or worked recently, according to the Center for Budget and Policy Priorities. In Houston and across the country, that includes quite a few who need help because their government jobs don't pay enough to live on. Of course, public employers are by no means the biggest culprit when it comes to low wages. Walmart, the world's largest retailer, is among the best known cases. U.S. taxpayers spend billions on public housing, food stamps and Medicaid to support the company's lowest-paid workers, according to several economic studies. While statistics on government employees on public assistance are sparse, they indicate that some of the money taxpayers save from low wages is reduced by the cost of safety net benefits. A study by the University of California, for example, found that nearly one in 10 of all government employees in New York State made less than $15 an hour — considered a living wage in many metropolitan areas - and received benefits such as food stamps and Medicaid. And that is likely an undercount, said the study's author, Ken Jacobs, since it doesn't capture people who work for the government indirectly through contractors other businesses that depend on government payments. "State and local government can be employers of low wage workers," Jacobs said. "But where we see that most is in the contracted services, heavily in health and human services, and heavily in more female occupations." That includes home health aides paid through reimbursements from Medicaid and Medicare, the government health insurance program for the poor and elderly, respectively. 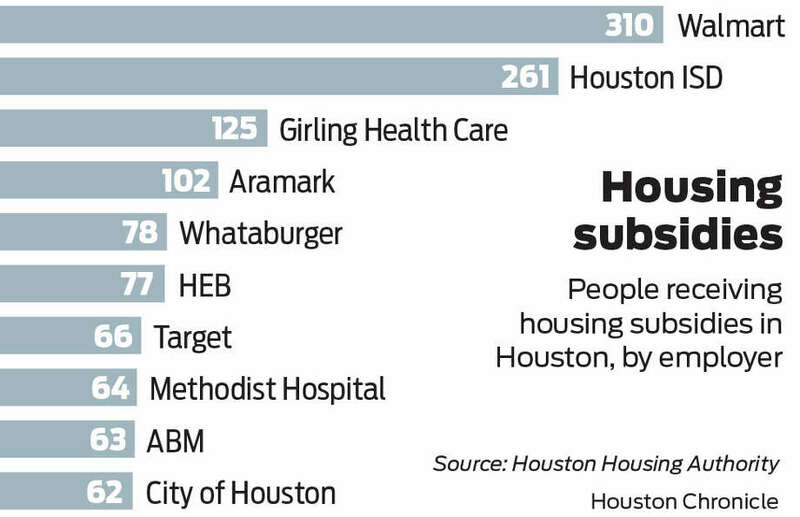 The health care industry employs the most renters receiving subsidies in Houston, about 21 percent of the housing authority's employed clients. The Houston School district pays an entry-level wage of $10 an hour, well above the state minimum wage of $7.25, but nowhere near enough to support a family. Those low wages are especially difficult for school employees, who have more unpaid vacations than most. Larkin doesn't get a paycheck all through the summer, or over Christmas or Thanksgiving, or any other holiday hen kids aren't in school. During those times, she can sometimes get temporary jobs, but still has to borrow money and go to churches for food donations. "That was the only way I could make it," Larkin said. A spokeswoman for Houston schools said the district strives to pay people enough to meet their expenses. "As one of the city's largest employers, the district is continually searching for ways to increase compensation and ensure that all employees make a competitive, livable wage," she said in a statement. The number of school district employees in subsidized housing is a small fraction of the 60,000 the Housing Authority served last year — 11,771 of whom were employed — and also of the school district's 30,000 employees, 6,200 of whom are non-professional staff like janitors, bus drivers, and cafeteria workers. At the same time, those figures likely underestimate the need, given the shortage of subsidized units in Texas. "If you get evicted and say 'I need help today,' there is not an affordable housing unit waiting," said Tory Gunsolley, who runs Houston's Housing Authority. "There aren't the federal resources and there aren't the state resources to fill all the gaps." 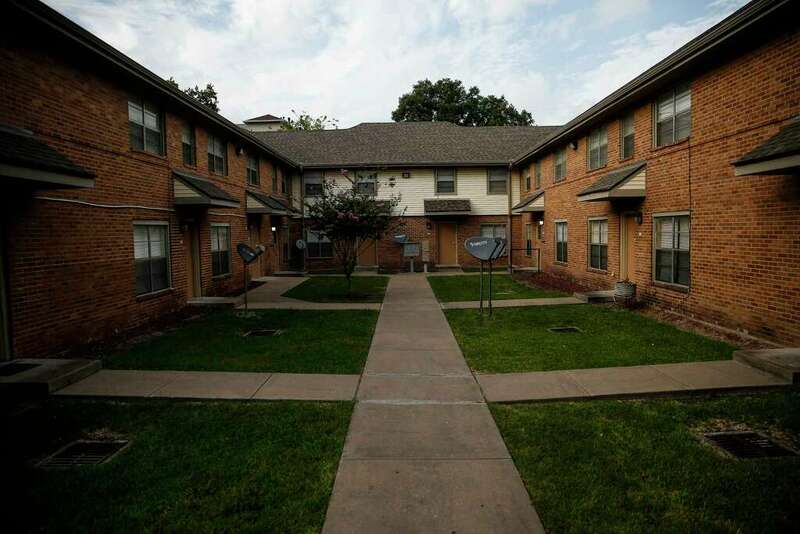 The state has about 57,000 public housing units and 145,000 families using rental vouchers, according to the Texas Department of Housing and Community Affairs. At the same time, 475,000 working Texans make less than 30 percent of the local median income and pay more than 30 percent of their income on rent, making them potentially eligble for housing assistance. On income alone, Darrell Stamps, an employee of Houston Public Works Department, would likely qualify for housing assistance if he applied and made it through the years-long waiting list. Stamps, who lives with his fiancee and three children, earns less than $30,000 a year. The income threshold for a family of five is $38,650. Over nearly 12 years with the city, Stamps' pay has risen from $8.28 per hour to $13.56, increases won in union contract negotiations. But mounting health insurance costs have eaten away at his higher wages, and there's only a few hundred dollars a month left to cover food, clothing, and medical expenses after paying for an $839 three-bedroom in Greenspoint. "It puts you in a situation where you have to weigh your options on a lot of things," Stamps said. "Because you might have a sick child, you got to take care of them, and take care of your house. It puts you in a bind." In Houston schools, more than 4,000 bus drivers, janitors, and food service workers represented by a local unit of the American Federation of Teachers won a raise in the minimum pay from $8.40 to $10 an hour last year; the minimum will go to $12 on September 1. Unpaid holidays, however, remain a burden. Opportunities to work during summer school are limited, so the workers need to get jobs for just a few months, which usually pay minimum wage. Many live in substandard housing, and some, said union leader Wretha Thomas, can't afford housing at all. "I have had bus drivers that had to sleep in their cars in the summertime," she said. "Right now we've got a couple food service workers living in their cars. They have to go to the gas station in the morning to clean up." One of Thomas' members, a cafeteria worker who declined to give her name out of fear of retaliation from her superiors, said she left public housing when she became a manager of her school's food service operation because she thought she'd get enough of a raise to rent a single-family home for herself and her two children. But she only got $12 an hour, fell behind on her rent during the summer holiday, and eventually was forced to leave when the landlord wanted to sell the home, pushing her and her children on to the street until she found a place that didn't require a credit check. One apartment later, she still sometimes can't pay the electric bill, and the ceiling leaks almost constantly. "Sometimes I don't have soap or toilet paper," she said. She wishes the district saw cafeteria workers as important to students. "Without the kids eating," she said, "they wouldn't be able to focus in school and do good in school." The Housing Authority has programs to help its clients get better jobs with higher wages, but Gunsolley said the authority can't help everyone looking for a family-sustaining position. There just aren't enough of those jobs to go around for people without higher education or specialized skills. "Low wage jobs combined with rising rents is a fundamental problem, whether workers have a public or private sector job," Gunsolley said. "The HHA helps the low-income workforce by providing affordable housing to sustain the cost of living." But there aren't enough resources to serve everyone who needs the help. This spring, the Housing Authority decided to close its voucher program and even pull back some that had already been granted because of looming federal budget cuts. While wage growth picked up overall in 2015, the bottom 20 percent of households were still making 5.7 percent less than in 2007, adjusted for inflation, according to the Census Bureau. Anne Dunkelberg, associate director of the left-leaning Austin think tank Center for Public Policy Priorities, said government policy can either redistribute income from high earners to supply basic needs for low earners, or push private employers to pay enough so workers can afford food, shelter and other necessities. Right now, neither is happening. "They're not paying a living wage, and we're not making sure [their workers] get public assistance," said Dunkelberg. "Neither system is providing."